Scrapbook Adhesives E-Z Dots Dispenser - DK-EZ Dots Refillable Dispenser With Repositionable Adhesive. This dispenser makes it easy to apply the permanent double-sided tape to whatever item you need it applied to. 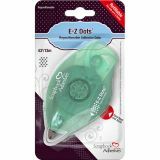 This 3-1/2x6-1/4 inch package contains one refillable dispenser and 43 feet of repositionable adhesive dot tape. Imported.